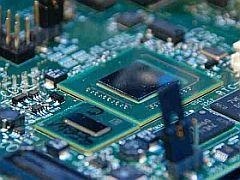 Future Horizons is forecasting four percent growth for the semiconductor industry during 2012, revising its predictions down due to ongoing economic malaise. At the Future Horizon Summit 2012 semi industry analyst Malcolm Penn indicated the likely growth in terms of shipments for the remainder of the year. The total growth figure is estimated to be approximately four percent, which is a reduction on the expectation of around eight percent highlighted at the start of the year. This is because optimism that the industry would emerge from the mire mid-way during the year has evaporated somewhat with the Eurozone crisis continuing to knock confidence. A figure of seven percent is given for the fourth quarter, 10 percent for the third, and three percent growth in the final quarter or 2012. The outlook is not too gloomy though, and Penn says of the growth rate that, in spite of some industry pessimism, one of the main messages is that growth “is not going to be zero” and decent growth is still attainable. As Penn points out, the chip industry is in better nick than some say – industry bodies being one of the prime examples. Penn highlighted that the expected growth levels forecast at the start of 2012 are not likely to change for the coming years. This includes anticipated growth of growth of 15.6 percent in 2013 and 16.0 percent the following year.